In this week's lesson students will sing their name instead of speaking their name. 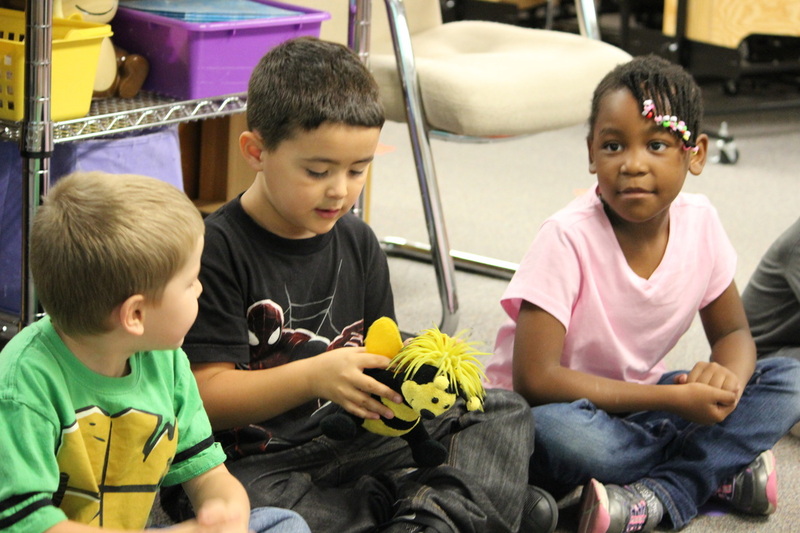 Students sings "My name is...."
As we do this activity we are passing my friend 'Hickety' who is a little stuffed bumblebee. Each student gets a turn to hold Hickety and sing their name to him. Hickety lives in a flower pot that sits on the piano. 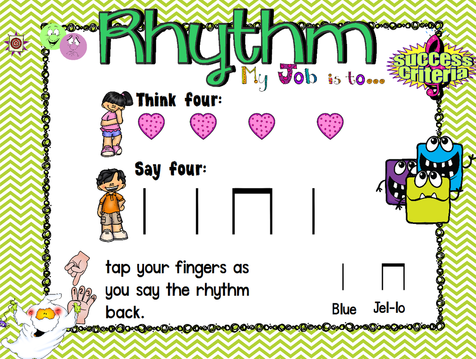 In this week's lesson I will sing the song as the students do the motions. Then I let the students sing it without me. I just do the motions. 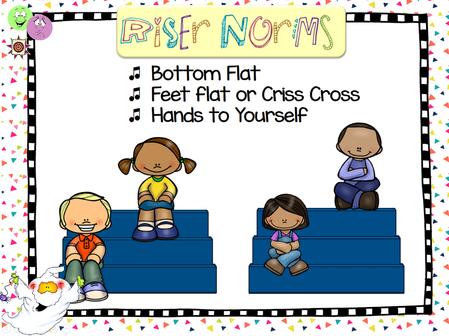 It's a new quarter and I give the students new assigned seats on the risers. Before I give them new spot, I go over the expectations of how to sit on the risers. This poster hangs up on the wall in my room. It's time to move to the next level. 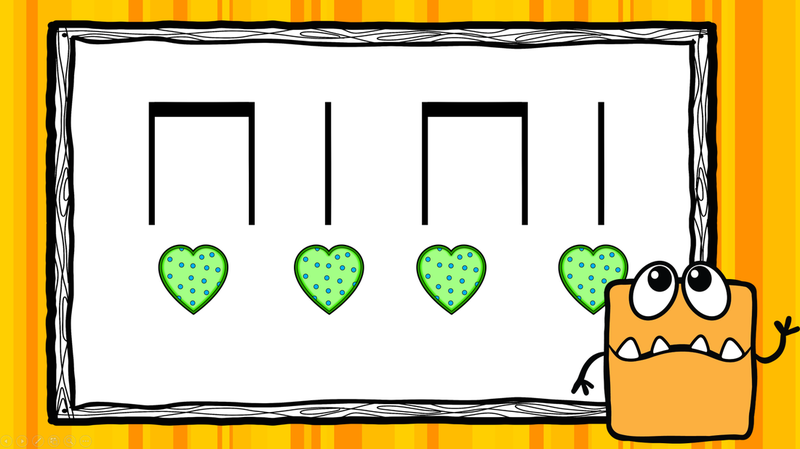 Students will think four counts and then read and say the rhythm. As they think four I tap the hearts with my laser pointer. As they say four I don't point to the rhythm. I don't want my students to become dependent of me always pointing to the music. click on image to get more info about this book. 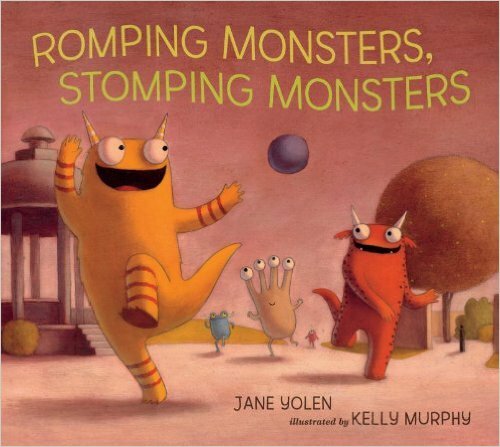 I found this book "Romping Monsters, Stomping Monsters by Jane Yolen and thought it would be fun to read before we move around the room like monsters. 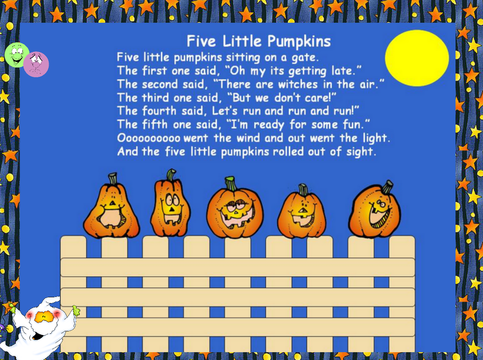 The book is very simple and easy to read and it goes through the different things monsters do at the park. We also shared things we like to do at the park. After I read the book it was time to move as monsters. "We Will Stomp" is by Mr. Eric and Mr. Michael. It's on the Yummy Yellow CD by the Learning Groove. I like the song because it's to the classical song "L'Arlesieene Suite". You can get this song from iTunes. Students move around the room and the music tells them how to move. We work on personal space and how we can't have our voices on because we need to listen to the music. I like to do actions songs with my kinders. 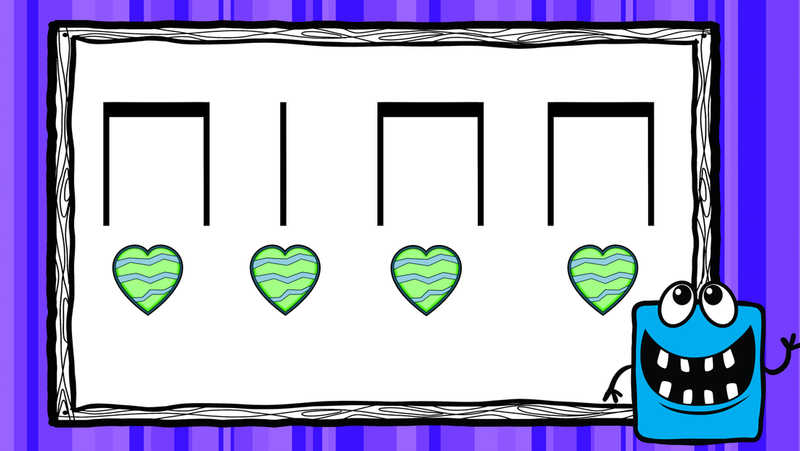 Actions songs helps provide a basis for musical understandings of form and expression. Each phrase has a motion; each new phrase - a new motion and the structure of the song or rhyme is assimilated through movement. 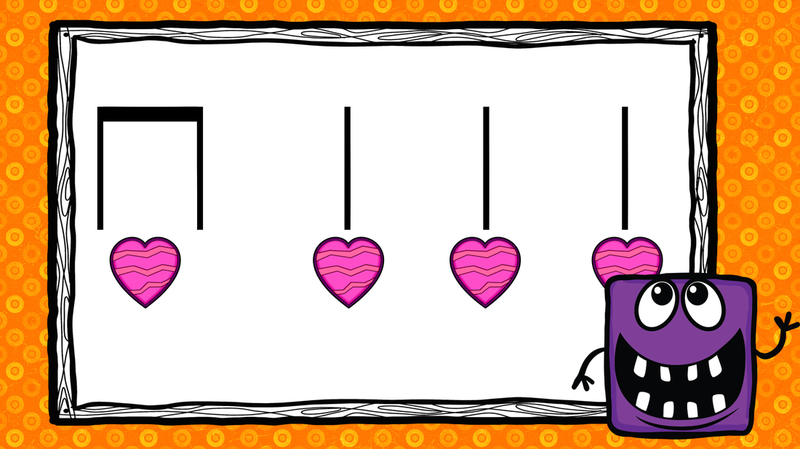 I also like actions songs because it helps students develop their dexterity of doing an actions while singing a song. Five Little fingers can be found on the Kidzone "Counting Songs"CD, on iTunes. 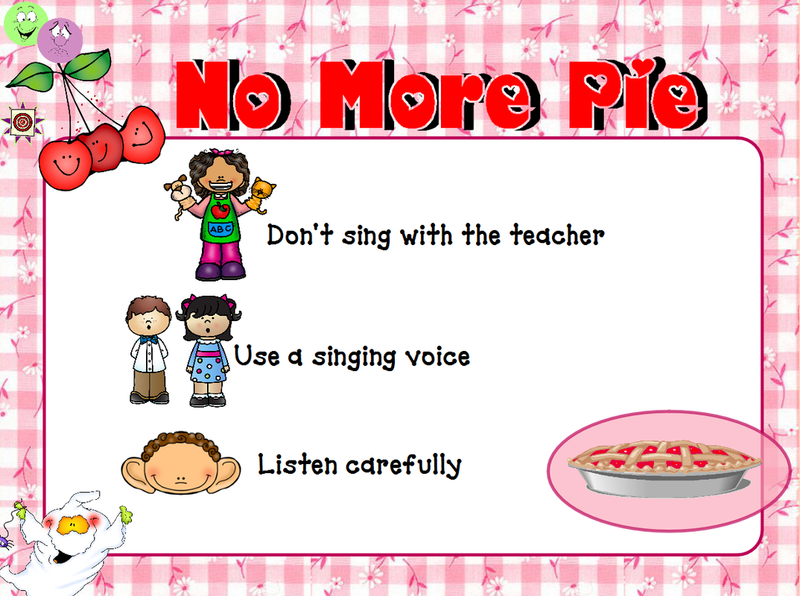 We sang our echo song "No More Pie" and then I told the students since they ate my pie that they had to help me make a new one. Students gave ideas of what to put into the pie (e.g. 5 strawberries) After we put the item in our pretend pot. 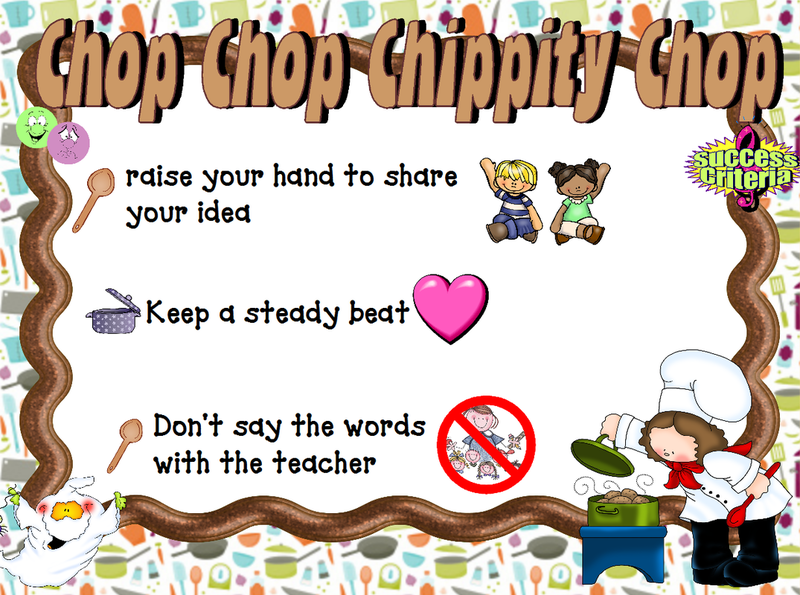 I would chant the poem "Chop Chop Chippity Chop". Then I would ask the students what else can we put in our pie. We would put that in the pie and then chant the poem again. I had 4-5 students give items to put in the pie.